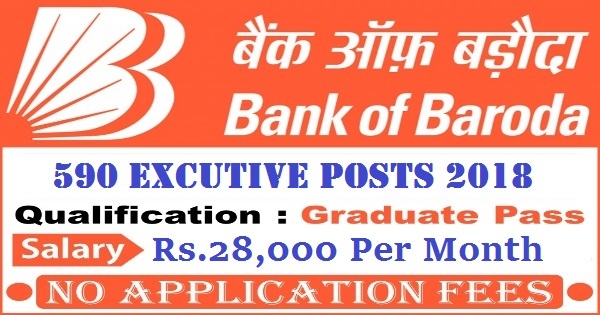 Bank of Baroda is inviting application from all Indian candidates for filling up 590 vacant posts of various job profiles. They are looking to heir fresher candidates for Sale executives. Some posts required experience also. We explain each and every posts detail below in this post. Read the whole article carefully before applying for these Government Jobs in India. What is the Application Fee Required? Candidates who are wishing to apply for this BOB Recruitment 2018 have to pay no application fee. All Indian candidates can apply for these Government jobs without paying anything. The candidates are going to be selected through combined written examination long with GD round and after that interview round. Those who cleared all these round will will appointed for the mentioned posts in the Bio-Data. What is the Process for Applying This BOB Requirement 2018? Candidates who fulfill all eligibility criteria have to send their BIO-DATA to the following mail ID “Salesforce.bob@bobcards.com” with a Subject which should be one of the following: “Sale Executive”, “Team Leader”, “Area Sales Manager”, “Processing Staff”. 25TH May 2018 is the Last Date to apply.